FinTech is transforming the financial services industry today, with completely new services already appearing worldwide. The insurance industry is also experiencing change through the emergence of InsurTech. One company making advanced efforts in InsurTech is Dai-ichi Life Insurance Co., Ltd. Based on a collaborative research with Hitachi that utilizes medical big data, the company is incorporating innovation in its life insurance business that provides " peace of mind " and " extensive health support" throughout the customer's lifetime. A need to resolve insurance business issues through digital innovations employing medical big data. Drew on a joint research with Hitachi to develop a quantitative assessment model that predicts likelihoods of hospitalization and lengths of stays owing to adult lifestyle diseases. 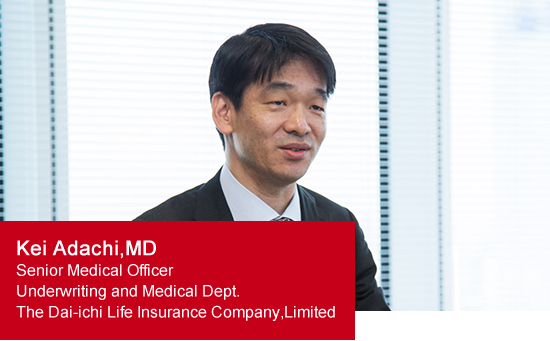 Dai-Ichi Life revised its insurance underwriting criteria so customers previously finding it hard to buy policies because of their health conditions could now get coverage. The company anticipates around 2,000 new policyholders in a year. Expand potential of life insurance business through innovation to become a life-time partner for its clients, contributing to their quality of life and healthy life expectancies. The effective use of medical big data is central to digital innovation. Japan is rapidly aging. By 2025, around 18% of its people will be over the age of 75. Around 10 million in this nation suffer from diabetes, a record high. It is crucial for Japan to build a framework that enables people to enjoy quality lifestyles by constraining the prevalence and severity of such lifestyle diseases and preventing national medical expenditure from expanding. There is rising hope that digital innovation using big data or artificial intelligence can help resolve these issues. For example, the complex analysis of medical data from medical institutions, health insurance union and other organizations could enable the earlier detection of various diseases and grasp the tendency of those deseases. Such learning could be used to improve the quality of preventive medicine, enhanced nursing care, and maintaining health. In other words, medical big data would be put to the test to generate new value. Undertaking joint research with Hitachi to revise insurance underwriting criteria to expand openings for policyholders. We are already seeing innovations materialize. One company leading the way is major Japanese insurer Dai-ichi Life. 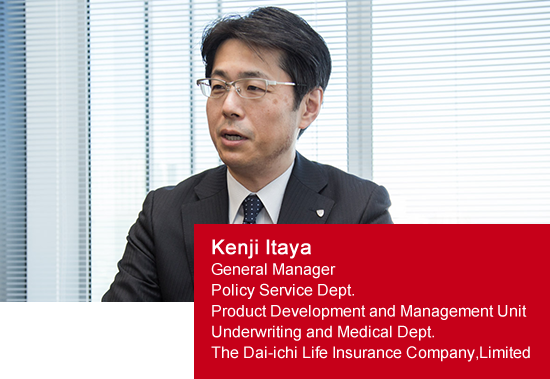 To bolster its role as a provider of peace of mind and extensive health support aligned with the life cycles of customers, Dai-Ichi Life puts together its own InsurTech activities to drive its own life insurance innovation, which it calls “InsTech”. The company gathered around 30 top talents from various departments to establish the InsTech Innovation Team, which pursues advances in three top priority strategic areas. These are healthcare, underwriting and marketing. But Dai-Ichi Life found it hard to go alone in InsurTech, which demands the latest technologies and expertise. So, the company brought in outside development resources and engaged in external collaboration and ecosystem work with other industries. Dai-ichi Life accordingly began a joint research with Hitachi in September 2016. After about a year, the two developed a quantitative assessment model to predict the likelihood of hospitalization and lengths of stay stemming from lifestyle diseases. This model was the fruit of three elements. Medical big data on around 10 million Dai-ichi Life policyholders, medical knowledge from insurance underwriting, and the analysis know-how from Hitachi’s medical expense prediction technology*. Dai-ichi Life used the model to review its underwriting criteria and provide coverage for some high-blood pressure patients undergoing active treatment. Insurers have traditionally made uniform decisions about whether to provide coverage or special contracts for people with lifestyle diseases or those who have histories of such diseases. But not everyone with the same illness faces the same risk. The quantitative assessment model enabled detailed decision-making to assess coverage for each individual. Why did the company choose Hitachi to partner on this project? It was because Hitachi’s expertise in an array of initiatives over the years have resolved issues in the healthcare field. Hitachi has developed a range of medical technologies and solutions, including in diagnostic imaging, notably for magnetic resonance imaging and ultrasonic diagnostic equipment. It has also developed electronic health records and testing systems for hospitals and medical institutions in Japan and abroad. The company also built a disease progressionmodel that uses artificial intelligence to predict incidence rates of lifestyle diseases and total medical expenses. Based on this model, it developed a solution to control annual medical expenditure on lifestyle diseases. The joint research with Dai-ichi Life drew extensively on Hitachi’s advanced technologies and know-how. Before engaging in joint research, Hitachi used NEXPERIENCE, a systematic process of collaborative creation with the customer to consider and share a new vision or business model to ensure that collaboration with Dai-ichi Life would go well. The two companies engaged on far-reaching discussions on creating customer value with InsTech by combining their knowledge looking 10 or 20 years ahead in a joint workshop. The technology was developed jointly by Hitachi and Hitachi health insurance society in order to predict incidence rates of lifestyle diseases and total medical expenses. Anonymized medical fee bills and specific health examination data were used to develop the technology. In the course of developing a quantitative assessment model to predict the likelihood of hospitalizations and lengths of stay owing to lifestyle diseases—the first research theme—Hitachi’s analysis experts worked full-time for a year in the Dai-Ichi Life department that assesses life coverage. Through this on-site work, they gradually acquired an understanding of the nature of policyholder data ( information when buying coverage, status when hospitalized after a considerable period, etc…) and assessment conditions. They also developed a technique to analyze risks for individuals with multiple diseases, and visualize the evidence of those analytical results, leveraging the medical data such as medical checkups and insurance claims of the 110,000 members of the Hitachi Health Insurance Society. They devoted extensive time and effort to evaluate and validate the findings. This new business model of broadening the customer base while controlling risks has tremendous impact on the life insurance industry, which is concerned with declining numbers of policyholders amid a decreasing birth rate. Dai-ichi Life’s management was also very satisfied with this outcome, and plans to continue focusing on bolstering services to materialize its “Customer First” corporate philosophy. To be a lifetime partner in promoting quality of life and healthy life expectancies. In light of the success of their initial effort, Dai-ichi Life and Hitachi entered a second stage of joint research in September 2017. They are undertaking basic research focused on changes in individual medical conditions and lifestyle habits. For life insurance policies, firms normally determine whether or not to offer coverage based on the health of applicants. But the risks of hospitalization or loss of life may differ among two applicants with the same health conditions depending on how their medical conditions and lifestyle habits change. Dai-Ichi Life therefore plans to review the coverage scope, develop services to prevent the prevalence and severity of diseases, and improve health by assessing changes in health conditions over time instead of assessing people just at the time of applications. The application of medical big data is a turning point for the venerable insurance business. Dai-ichi Life Insurance plans to keep pioneering innovation in its industry in Japan by pursuing cross-industrial collaboration. Hitachi will continue collaborating with other companies to create advanced healthcare solutions that improve the quality of life and bolster medical quality, and contribute to healthy, secure, and safe lives in societies the world over.